A small village near Rajgir, Jethian is among Buddhist pilgrimage sites in Bihar that are Jethian in Bihar of great significance. Also known as the Lativana or the Palm Grove, it is the place where Lord Buddha met King Bimbisara for the first time. In 7th century AD, Jethian became seat of power of Jayasena, the famous saint. The Chinese pilgrim, Hiuen Tsang spent two years, studying Buddhism in India with Jayasena. Buddha headed for Rajgir to meet King Bimbasara after coming from Sarnath and Bodhgaya. When the king came to know of it, he and his staff went to the outskirts of the city of Rajgir to welcome the Buddha. Buddha statues and Buddhist structures are aplenty in and around Jethian. There is a large mound with a tank, believed to be the remains of the stupa built over the Supatittha Cetiya, where the Buddha stayed while residing at Jethian. A remarkable statue of Buddha stands tall beside the mound. 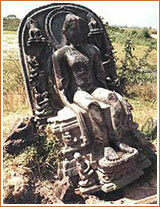 Situated close to the mound are the statues of Padmapani and Buddha, famous Buddhist pilgrimage sites in this region. Jethian is suggested in the list of tourist spots for people who are touring as a Buddhist pilgrimage in India. Chandu Hill : 3 km away from Jethian is a large cave called Rajpind atop the popular Chandu Hill. Thecave is mentioned in the Tripitaka. Nalanda : In Nalanda, one can see ruins of the world's greatest Universities of 5th century including many temples and monasteries. Bodh Gaya : Bodh Gaya is among the four prime Buddhist pilgrimage sites in India. Gautama Buddha attained Enlightenment here, and became the Buddha. By Rail : Rajgir is the nearest railhead, well connected with Gaya. By Road : Regular buses and taxis ply from Rajgir to Jethian.